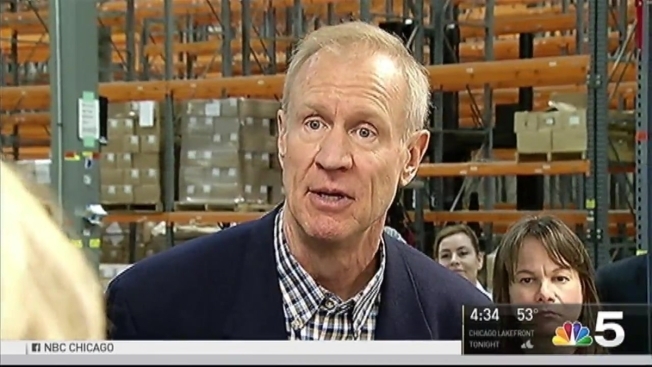 Governor Bruce Rauner began a two-day tour through the state of Illinois on Tuesday – but refused to call it a re-election campaign swing. NBC 5's Mary Ann Ahern reports. Governor Bruce Rauner began a two-day tour through the state of Illinois on Tuesday – but refused to call it a re-election campaign swing. After a lengthy early morning radio interview in which the Republican defended his record, he headed to Elmhurst for a rally. Local Republicans were told to be at the event, but not to publicize it in order to keep protesters away, though a few showed up anyway. As the incumbent governor, the line gets blurrier on what constitutes official business and what is campaigning – but Rauner continually claimed the events were not political in nature. Rauner is already running TV ads, with his approval ratings around 30 percent, and his Democratic opponents – who are out on the campaign trail – believe that’s why he’s crisscrossing the suburbs and downstate as well, with no Chicago events on the schedule. “There’s a lot of time, there’s a lot of Democrats in the race – that’s fine, let them fight their own fight,” said Illinois House Republican Leader Jim Durkin. One of those Democratic challengers spent part of Tuesday at Northeastern Illinois University, where students and staffers held a rally as the state budget crisis forced the school to begin a three-day furlough. “I don’t know how we’ve gotten to a place in this country where we can pick on the salaries of a public sector worker, a professor, a teacher ,a carpenter, a plumber and that is somehow an American virtue,” asked 47th Ward Alderman and gubernatorial candidate Ameya Pawar. A spokesman for Rauner pointed out that if NEIU is in a budget crisis, it raises questions as to why the school was willing to spend $90,000 on an executive search for a new president, or until a donor stepped in, $30,000 to former White House Adviser Valerie Jarrett for a speech at commencement. Tuesday afternoon, Jarrett did agree to speak at the school’s graduation ceremony for free.